Hurkey Creek, Crestmore Manor, Lake Skinner, Idyllwild Park, Box Springs Mountain and Santa Rosa Plateau Ecological Preserve -- six of the 20 varied parks, museums, recreational and nature centers of Riverside County covered in a new book by local historian Steve Lech. 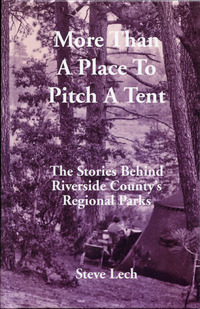 The 150-page, hardcover book -- "More Than a Place to Pitch a Tent" -- tells the stories behind Riverside County's major regional parks, with background information on how they came to be and how they were named. Numerous color and B&W photos from the past and present help illustrate the histories. Steve also delves into the insights and backgrounds for the six directors of the county's Parks Department following its creation in 1960 (it was previously administered as part of the county's Road Department). In the book are several Riverside-area parks, including Box Springs Mountain Preserve, Hidden Valley Wildlife & Nature Center and Martha McLean - Anza Narrows Park. Steve points out that all three had been threatened by development pressures before becoming incorporated into the county's parks system. Of particular interest to us is the background of Hidden Valley. The park, which straddles the Santa Ana River in northwestern Riverside near Norco, had been an upscale gun/hunt club from about 1957 until the early 1970s. Members included Clark Gable, Ernie Kovacs, Roy Rogers, Lawrence Welk, Les Richter and Jimmy Doolittle. Today, the old clubhouse serves as the park's nature center. We also found intriguing the stories behind Lake Skinner near Temecula, Bogart Park in Beaumont, Lawler Lodge near Idyllwild and Crestmore Manor in Jurupa Valley. Crestmore, with its stately home,* was built for Los Angeles restauranteur and thoroughbred horse breeder Tiny Naylor (yes, of Googie coffee shop** fame). Unknown to us prior to reading the book was that noted Riverside architect Herman O. Ruhnau (Riverside City Hall) was the designer of Crestmore. Steve is the president of the Riverside Historical Society and author of several local history books, including "Riverside: 1870-1940" and "Riverside in Vintage Postcards," both from Arcadia Publishing. Most impressive is "Along the Old Roads," Steve's in-depth book on early Riverside County history and the factors behind its formation. The book is a must-have reference for local historians. Most of Steve's books can be found at local museums and some bookstores. You can also visit his history blog for contact info on purchasing the books.